(April 2, 2014 – Los Angeles, CA) Aleph Records is proud to announce the label’s first ever vinyl release, BULLITT – composed by legendary composer Lalo Schifrin (Mission: Impossible, Rush Hour trilogy). The album will be released in conjunction with record store day on April 19, 2014. The album is a limited edition individually numbered vinyl release (1000 copies) and will feature newly commissioned liner notes by Jon Burlingame. The 200-gram vinyl of the BULLITT soundtrack will feature both the record and movie version of the score – for the first time on vinyl. This limited edition also features score cues never before released on vinyl. Included in the album will be a digital download card of the album. Soundtrack Magazine called BULLITT "...arguably the best jazz-based film score of the '60s.” Allmusic.com says, "The end result is a soundtrack that succeeds both as a film score and a stand-alone album. This unique combination makes Bullitt one of the finest achievements in the Lalo Schifrin catalog and one of the best action film scores ever written." 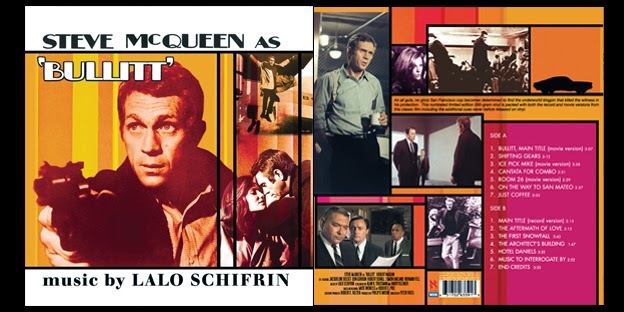 Schifrin has written over 100 film and television scores including Mission Impossible, Mannix, Cool Hand Luke, Bullitt, The Cincinnati Kid, Amityville Horror, Enter The Dragon, four of the Dirty Harry films, and more recently Abominable and the Rush Hour trilogy. Lalo Schifrin has now won five Grammys® (twenty-two nominations), one Cable ACE Award, and six Academy Award® nominations. His longtime involvement in both the jazz and symphonic worlds came together in 1993 as pianist and conductor for his on-going series of “Jazz Meets the Symphony” recordings.